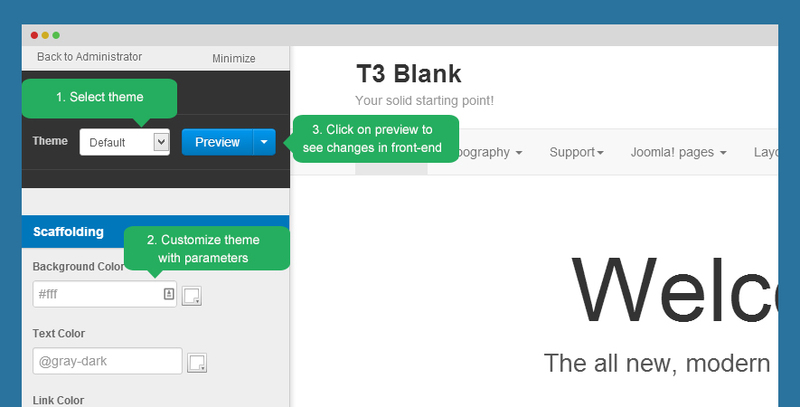 Guidelines of how to customize T3 BS3 Blank template. To change width of template, open file: variables.less in: templates/t3_bs3_blank/less then change defined width of template. Now change the size for the responsive layouts. And here is the grid system. You can change the number of grids. 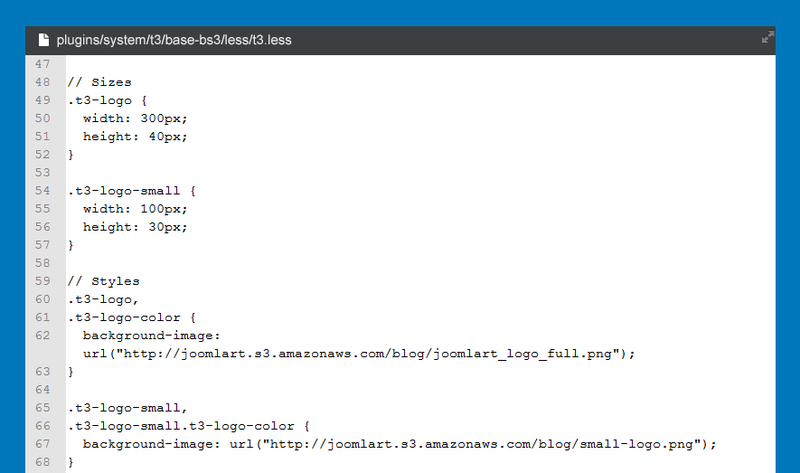 1. template.less this file includes style that is customized from default theme. 2. variables.less: this file includes customized variables from default variables.less file. 3. variables-custom.less: this file includes new variables that you create to customize current theme. The best way to create new theme is cloning theme folder. In the back-end, you can select the new created theme for style you want then customize theme with ThemeMagic. Please do not customize your theme with the CSS files, as they will overriden each time you run Compile LESS to CSS. All added css files will be loaded when site runs on the theme, by this way, all files are loaded from 1 folder only then it will improve site performance. T3 Framework is developed with LESS, the LESS files are compiled to CSS files. Each time you compile, CSS files will be overridden so we suggest you not to use CSS to customize, develop your site because when you compile, your work can be lost. The custom.css file is located in: templates/t3_blank/css . If you don't see the file, create new file then open that file to add CSS to style for your template. The file is not included by default, you need to create new one. The file is the last file to be loaded in your site. The Custom.css file is the same as any other CSS file. Enter the CSS to style for your template. T3 Framework is powerful by its easy theme customization based on ThemeMagic. You are allowed to add unlimited parameters for customization. You have to enable ThemeMagic first, then click on the ThemeMagic button to open ThemeMagic pannel. Define LESS parameter with the same name as defined above @your-field-name in file variables.less in template/less/. Open the language file of the template en-GB.tpl_t3_bs3_blank.ini located in language\en-GB\ and define language key that you use to define parameters above. Each style can go with different logo. To set style for the logo, please open Theme settings in Template style setting. #1: how to disable the footer logo? To disable the footer logo, open T3 template manager, in the Global tab, disable T3 Logo option. <a class="t3-logo t3-logo-color" href="http://t3-framework.org" title="<?php echo JText::_('T3_POWER_BY_TEXT') ?>"
The style of footer logo is in the t3.less file located in plugins/system/t3/base-bs3/less. Open the file and customize style of the logo. The T3 copyright info is in the default.php file located in templates/t3_bs3_blank/html/mod_footer. Open that file and customize T3 copyright info. 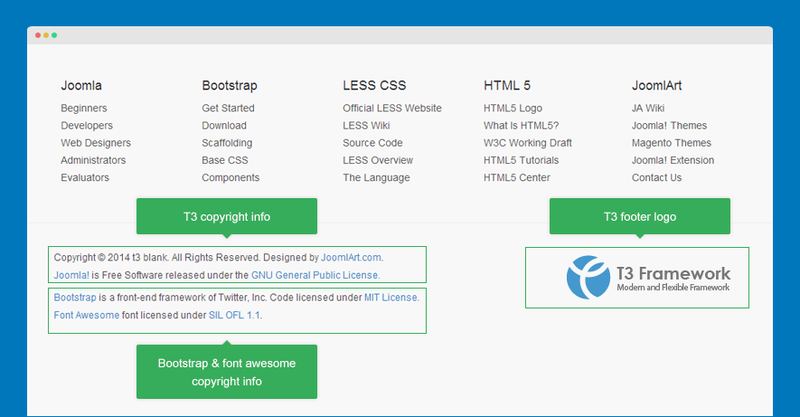 Open the footer.php file located in templates/t3_bs3_blank/tpls/blocks/ then customize the copyright info of Bootstrap and font awesome. Upload your font package(s) to templates/t3_bs3_blank/fonts. Open this file and customize it as you want the page to be. You can define which CSS file that the page will use. You can create new css file for 404 page but we suggest to copy the default joomla error.css file in templates/system/css then paste to templates/t3_bs3_blank/css/ folder. Open the file and start your customization. One more thing is that each theme can use different CSS file so that it will have different style. The CSS files are NOT overridden when you compile LESS to CSS. Step 1: add new offline.php file. Open this file and customize it as you want the Offline page to be. 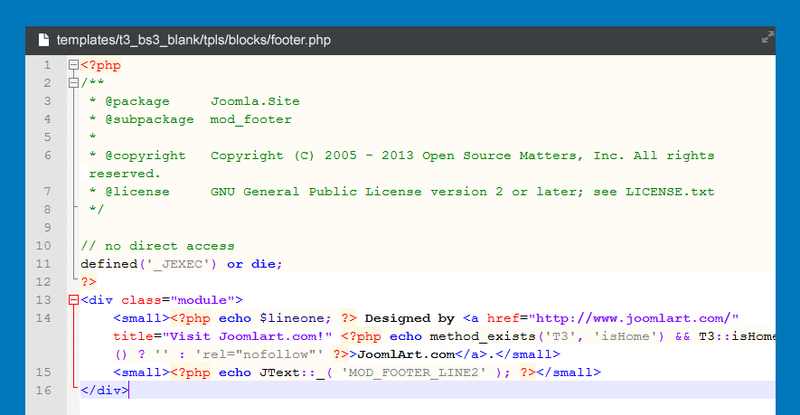 You can create new css file for Offline page but we suggest to copy the default joomla offline.css file in templates/system/css then paste to templates/t3_bs3_blank/css/ folder. You can define each theme to use a css file so that each theme will have different style for Offline page. To add this button in your site, open the file templates/t3_bs3_blank/tpls/blocks/footer.php then add the following code to the file. T3 Framework allows you to create multiple instances for Megamenu. 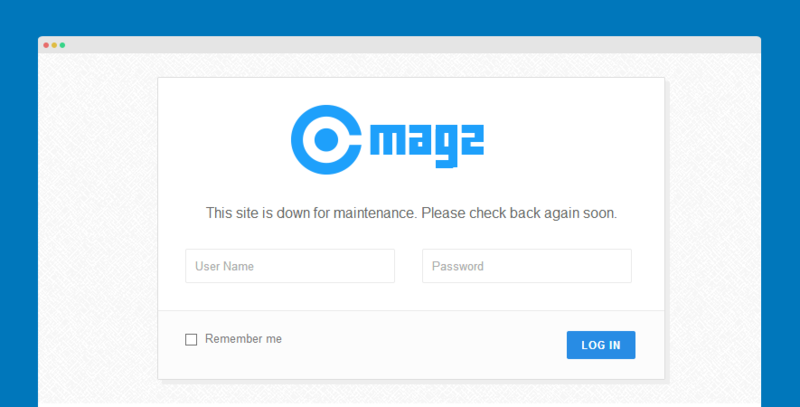 In this writing, we will create Megamenu for Main Menu and Top Menu on a site. Duplicate file mainnav.php in templates/t3_bs3_blank/tpls/blocks then rename to topnav.php. "mainmenu" is the menu type name of Main Menu. Open topnav.php file then replace the following code. Please note that the topmenu is from menu type name. Open file home-1.php or default.php in templates/t3_bs3_blank/tpls.